This dive site, a lava flow remaining from Mount Agung, is located on one end of Tulamben's bay just opposite to the location of the wreck. It starts off with a steep sloping sandy drop with plenty of nudibranches, prawns and shrimps. At 12 meters you'll find sponges, leaf scorpion fish and crinoids, often hiding a Ghost-Pipefish. Further to the east the slope becomes a magnificent reef which develops to a vertical wall, beginning at 15 meters descending down to 60 meters. The wall is inhabited by sponges, corals, black coral bushes and huge gorgonians. You'll sure see a 3 meter sized gorgonian like a pointer at 30 meters. The fish life at the wall is similar to the wreck, just spread over a more vast area. 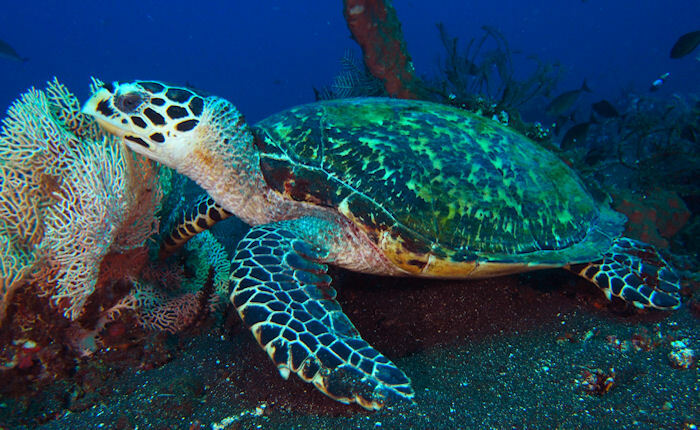 It is likely to come across with white tip reef sharks, big Napoleon fish, bumphead parrot fish, file fish and morays. There have been sightings of whale sharks as big as 9 meters and, much deeper, Great Hammerhead Sharks. The shallows from 5 meters and above makes you feel as if you are swimming in an aquarium. Here you'll find all sorts of reef fish and some interesting small animals, an ideal place to decompress after your dive. No easier place to do when you have so much to see and enjoy.